At A-1 Affordable Bail Bonds, our goal is to be a source of help in your time of need. We know just how difficult it can be to get a late-night phone call informing you that a loved one has been arrested. Countless thoughts race through your brain. What should you do first? The answer is simple. Contact the team of experts at A-1 Affordable Bail Bonds. We would be happy to provide you with advice on your situation and recommendations on what to do next. It’s as simple as that. Whether you’re searching for bail bonds in Ascension Parish, Assumption Parish, Lafourche Parish, St. Mary Parish, Terrebonne Parish, or one of the other 59 parishes in Louisiana, you can always count on our team of experts to take great care of you at every step of the way. If you’re searching for bail bonds in Donaldsonville, Sorrento, or Gonzalez, you’ll be glad to hear that you can find them at A-1 Affordable Bail Bonds. Simply pick up your phone and give us a call or contact us online. We proudly offer 24-hour bail bonds, ensuring that no matter the time of day or night, you can get the help that you need. When it comes to purchasing bail bonds in Ascension Parish, look no further. In search of bail bonds in Napoleonville, Belle Rose, Bayou Corne, Pierre Part, or one of the other cities in Assumption Parish? Our team has you covered! When you need to find a great bail bondsman who can walk you through the steps that you need to take, that’s exactly what you’ll find at A-1 Affordable Bail Bonds. We pride ourselves on offering amazing service every step of the way. If you live in Golden Meadow, Lockport, Thibodaux, or one of the other areas within Lafourche Parish and you’re in need of bail bonds, put your trust in the team at A-1 Affordable Bail Bonds to take great care of you no matter the situation. We pride ourselves on providing our clients with a level of customer service that is simply unmatched in our industry, so when you’re in need of a helping hand, don’t hesitate to reach out to us because we’ll be there for you. Whether you’re in Franklin, Morgan City, Berwick, Baldwin, Patterson, or one of the other cities in St. Mary Parish and you’re in need of bail bonds, you know where to turn. With a track record of success and a dedication to getting the job done the right way, you can put your trust in our team. There’s nothing in the world like knowing that you have someone you can trust (and who knows how to make it through a situation) when you are in the middle of a tough time and when you choose to partner with us, that’s what we’ll aim to be for you. From Bayou Blue to Bayou Cane, Montegut to Schriever, and Bourg to Houma, if you need bail bonds in Terrebonne Parish, we have you covered. Regardless of the situation that you are facing, you can know that all it takes is getting in touch with our team. We’ve been in business long enough to have seen it all and that means that we’re qualified to offer advice to help you make it through a tough time. Do You Know Who To Turn To When Times Get Tough? It’s the middle of the night and you’re fast asleep in your bed; that’s when the phone rings. It’s a number that you don’t recognize, and your mind starts racing. “Who could it be? Is something wrong?” You decide to pick up just in case. Those aren’t words that anyone particularly wants to hear, but the truth of the matter is that people can get arrested for a number of different reasons and at all times of the day and night. The good news is that if you’re ever in a position where you get this type of phone call, you don’t have to panic. Rather than fearing for the worst, you can simply get in touch with a local bondsman at A-1 Affordable Bail Bonds to get all of the help that you need. We proudly offer 24-hour bail bonds, ensuring that you’re always able to get in touch with someone who can walk you through every step of the process that it will take to get your loved one out of jail. 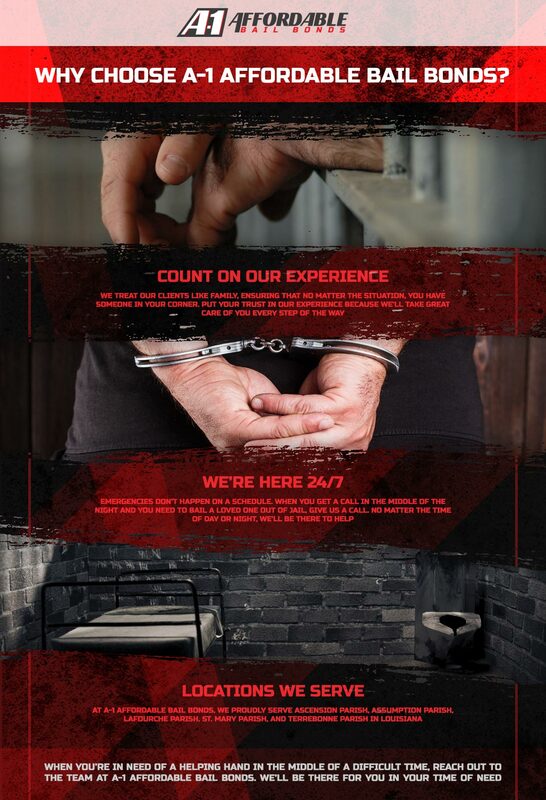 We pride ourselves on working quickly and efficiently, ensuring that your loved one is able to get out of jail fast. Our team of experts is able to process paperwork and get the ball rolling within 15 minutes. Although we can’t guarantee how quickly your loved one will be released from jail, we can guarantee that we’ll be working as quickly as possible to make it happen. Contact Us Today! Get Help Fast! When we say that we offer excellent customer service, that’s exactly what we mean. Our team believes in being there for our clients as much as humanly possible. We take our jobs seriously and that means doing everything we can to make sure that your family is taken care of in the midst of such a difficult time. One of the ways that we can help is by offering options that are tailored specifically towards your unique needs, ensuring that you are able to get exactly what is necessary. Our budget-conscious plans are designed to meet your needs while you figure out what’s next and we want you to know that we’ll be there to help you along the way. Have a question about your payments? Need some advice on what steps to take next? Whatever the case may be, you can count on us to be there to help you out at all times. We care about the outcome of your situation and we’ll go above and beyond to prove it. To put it simply, we have posted bonds for hundreds of community members over the years. We understand that this may be a unique experience for you, and therefore we’re happy to take the time to explain everything you need to know abou how the process works. We will also act as your advocate during this stressful period. In short, whatever you need, it’s our goal to be there for you. It’s as simple as that. Whether you’re dealing with misdemeanor charges for theft, assault, or graffiti, or you have been charged with a felony such as a DUI, burglary, or robbery, our goal is to bail you out of jail as quickly as possible so that you can get back to your life. One question that people ask us on a regular basis is whether or not bail bonds are necessary when you have enough money to cover the bail amount. The truth of the matter is that it just depends from situation to situation. In some instances, you can probably get by just fine by paying the bail on your own; in others, that will most certainly not be the case. Our advice on the subject is to carefully consider all sides. For example, you might have money in your bank account to cover the bail amount, but does that leave you with enough money to pay your utility bills? Will you have enough left over to pay for your mortgage or your rent? Does that leave you without a way to purchase groceries? What about having to pay for any costs related to going to court? If the answer is that you’ll be left without money for life’s other necessities, then it’s probably going to be in your best interest to work with a bail bond agency, and the good news is that at A-1 Affordable Bail Bonds, we would be happy to take a look at your specific option and tailor a payment plan to suit your needs. Just be sure to let us know about the specifics of your situation and we’d be glad to see what we can do to make sure that you are well taken care of. As you probably know, a judge will take a look at a handful of different things when deciding what the bail amount should be (and, of course, whether to offer bail at all). In addition to the track record of the person who has been arrested, a judge will also look at the type of crime committed, the likelihood that the person who was arrested will flee, and other circumstances surrounding the arrest. The good news is that when a person is eligible for bail and you are in search of affordable bail bonds, we can help; after all, affordable is our middle name! We mentioned it above, but we know just how stressful it can be to bail a loved one out of jail. Regardless of the circumstances of the situation, you’ll still likely want to help get that person out quickly and we can help. Once again, whether you’re in Ascension Parish, Assumption Parish, Lafourche Parish, St. Mary Parish, or Terrebonne Parish, you can count on the team at A-1 Affordable Bail Bonds to provide you with exceptional service at every step of the way. We’ve been in business long enough to know what it means to take great care of our clients and we’re not exaggerating when we say that we strive to treat each person that comes to us for help like our own family members. At the end of the day, our greatest mission is to take your difficult situation and make things a little bit easier. Whether that’s by answering questions or offering advice, you can rest assured that we’ll be here to help you in your time of need. 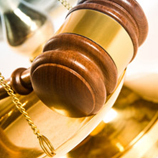 Regardless of the situation at hand, you can put your trust in the team of experts at A-1 Affordable Bail Bonds. Contact us today, and rest assured that you’re in good hands. We look forward to hearing from you.